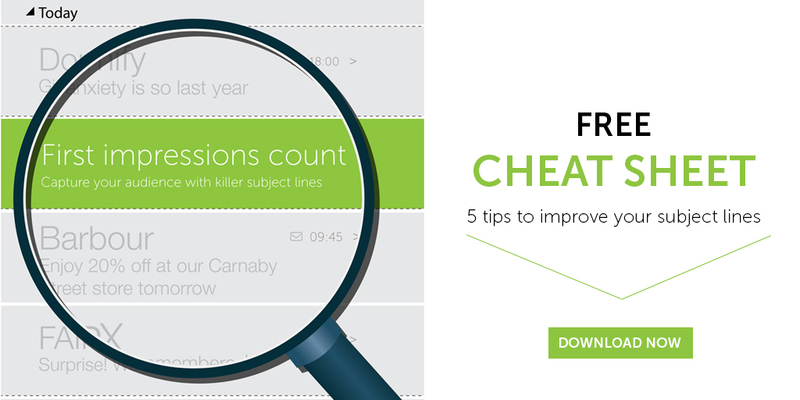 Email subject lines can go one of two ways: you’re either going to win or your email will be thrown straight in the bin. It’s as simple and cut-throat as that. So how do you give your email the best chance of being read? Last year, we sponsored an Email Tracking report created by the UK Direct Marketing Association (DMA). The results revealed that each week, consumers receive around 40 emails from brands they trust. Consider that number alongside all the other likely emails landing in people’s inboxes and you realize just how important it is to create subject lines that leap out. Don’t let all those hours of hard work creating your emails go to waste. Try these different techniques – and don’t forget to test them and record the results! If you’re offering a great discount in your email, shout about it. A subject line that says ‘Offer inside’ is weak if you’re sending out a discount code with 30% off. Ever watched a TV ad that’s totally pulled on your heartstrings? Why not try the same with your subject lines. If you’re a greetings card company, for example, you have plenty of opportunities to appeal to people’s softer sides for upcoming events like Mother’s Day. Everyone likes something that makes them giggle, especially after a bad day. Drop a funny one-liner or provide a witty take on what’s in your email and you could make people’s day (and get that all-important open). If you’re working hard to make your content relevant and personalized, don’t let an impersonal subject line let your email fall at the first hurdle. Personalization lets you pull in your subscribers’ names and dynamic rules let you insert everything from people’s locations to information based on past orders. There are some emails you shouldn’t mess with and those are transactional emails. For instance, if a customer has ordered something from you, it’s common practice to include the order number in your subject line. Going off topic might mean the email they were expecting from you will get lost and might lead to a call.